Oh, hidden object games, why must you be so divisive? I’m a huge fan of hidden object games, but my boyfriend usually can’t stand them, and more frequently, people just have no idea what they are unless I mention something like Where’s Waldo. Lately there’s been more of a kick to get away from the I Spy model of finding random things in a picture to incorporating the hidden objects into some kind of story. A port of a casual PC game, The Mystery of the Crystal Portal is sort of what you’d get if you combined Indiana Jones with Where’s Waldo: lots of international travel and intrigue while seeking out random objects. The heroine of the story is Nicole Rankwist, an intrepid young reporter from the 1920’s, whose archaeologist father has disappeared while searching for, surprise surprise, the mysterious Crystal Portal. While following the international trail of dear old dad, you must collect up a number of various items, most of which are appropriate to the setting, but the placement of these objects is often, er, unusual. For example, there’s no good reason for a teapot to be sitting on the roof, even if you are in Japan. The artwork in the game is actually quite lovely. The various countries and areas you visit are unique and detailed, and usually the objects look somewhat incorporated to the scene, so they’re not just stuck into the picture haphazardly. And the music is similarly scene-appropriate. I’d love it if these games didn’t necessarily pander to the broadest cultural stereotypes, but that’s a battle for another day. The settings are all highly interactive, with the sets of objects you’re looking for actually nested into the scene. Find a hotspot and pictures of four or so objects to look for will pop up. Once you find an object, you must then drag it over to the appropriate hotspot, and sometimes objects are hidden behind or within other items. This adds an additional layer of challenge, but even with that, the game is very short, only lasting a few hours and with very limited replay value. Although brief, this is a very polished example of the genre. Fans will certainly enjoy it, although others may find it a little on the slow side. In general the interface works quite well, although I was filled with a sputtering rage every time I earned a medal prompting me to post to Facebook. I couldn’t figure out how to turn this “feature” off, and it irritated me every single time. If you get stuck, you can get a free hint every few minutes, but they also prominently advertised an option to purchase extra hints for $0.99. Now, this didn’t interfere with the gameplay at all, but it stood out as a particularly stupid option, one that smacked of pointless money-grubbing, and I found it a highly distasteful move. Overall, The Mystery of the Crystal Portal is a very pretty game, and you can certainly get a few hours of solid game time out of it, but it is slow and you must be wary of extra sales features. The full price of $4.99 is much too high for what it offers, but if you act now, there is a 40% off sale until May 3rd. 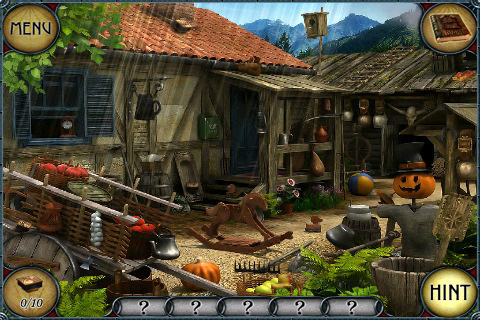 AppSafari review of The Mystery of the Crystal Portal was written by Tracy Yonemoto on April 27th, 2010 and categorized under Adventure, App Store, Games, Puzzler. Page viewed 3554 times, 1 so far today. Need help on using these apps? Please read the Help Page.